At the plate Margot is still raw, but he has plus bat speed and quick hands. He has a fluid swing, but can be a little long to the ball at times and he looks much more comfortable pulling the ball. He has an aggressive approach, often jumping on first-pitch fastballs. His pitch recognition is a work in progress; he struggles to pick up secondary offerings out of the hand, often clearing his hips early and being caught out in front. As he gets more at-bats and sees more pitches, he should become more comfortable against secondary offerings and consistently work deeper into counts. Margot’s present power is well below average, but he has shown the ability to drive the ball with backspin when he squares it up. One instance of this stands out: early this year he got a fastball on the inner half that he turned on, pulling his hands in and driving the ball deep off the left-center field fence for a double. As he gets stronger and more mature this ball will easily clear the fence, but his power could be slow to develop, so I wouldn’t count on him to hit many home runs early in his stateside career. Eventually, however, he could develop slightly below-average to average power. When combined with a potential plus hit tool and plus-plus speed, he has the makings of a potential top-of-the-order hitter with the defensive ability to stay in center field. 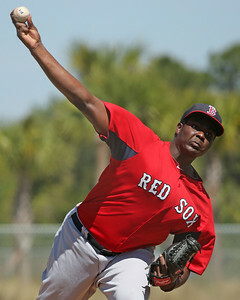 - The first thing that stands out with right-handed pitcher Simon Mercedes (pictured) is his size. Mercedes has a big frame, listed at 6-foot-4, and is already well filled out. His conditioning is something that he will always need to watch, but currently it isn’t a major issue as he’s relatively proportional. His mechanics are still a work in progress, but they could improve as he continues to develop through further repetition both in game situations and behind the scenes. Back in Fall Instructs when I first saw Mercedes, he already showed present stuff, and in the recent look he showed that his stuff was progressing. In the game against the Rays last fall, Mercedes sat 91-94 mph with his fastball and also showed a curveball and changeup. In the recent start, Mercedes showed a live arm early, coming out of the gate 92-94 mph and topping out at 95 mph. The pitch also showed more movement than last fall, running down and in to right-handed hitters. After the second inning, however, Mercedes settled into more 91-93 mph, and deeper into his outing his velocity ticked down again, finishing out around 90-91 mph. Throughout the outing he struggled to command the offering, missing consistently arm-side and struggling to pitch on the inner half against left-handed batters. He left too many pitches out and over the plate and, as a result, was hit around pretty hard. Since Mercedes was struggling to command his fastball, he started to incorporate his secondary offerings more, almost pitching backwards at times. His changeup was the better of the two offerings during this look, showing late dive on occasion and much better arm speed. In the fall he threw the pitch 85-87 mph, but this time it was clocked 80-85 mph. He was most successful with the pitch when he threw it at 82-83 mph, but the release point of the pitch is still inconsistent. Furthermore, his lack of feel for the offering shows, as at times it got away from him and acted more like a fastball that he took something off. Mercedes threw his breaking ball less than his changeup, but it showed some flashes of potential. He threw the pitch in the high 70s and it showed better shape than last fall, when it was more slurvey in the low 80s. He got a couple of swing-and-misses in the first two innings, including one on a tight 11-5 breaker at 76 mph, down and away from a righty. He was inconsistent with the offering, and by the third inning it took a back seat as he threw almost solely fastballs and changeups for the remainder of the outing. To project as a starter long-term, Mercedes needs to continue to develop his secondary offerings and refine his command. If these things don’t occur, Mercedes’s fastball could play well in the bullpen where he could get away with only average secondary offerings and command.